Neal & Massy Caledonia AIA will defend its Caribbean Club Championship crown after T&TEC FC withdrew its claim to participate in the regional competition due to financial constraints. 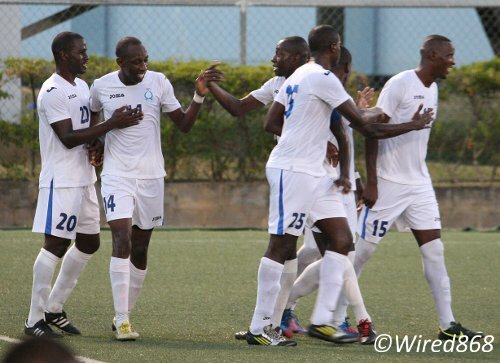 DIRECTV W Connection and T&TEC were due to represent the Trinidad and Tobago Pro League in the Caribbean Football Union (CFU) tournament after finishing first and second respectively in the 2011/12 season. However, T&TEC has struggled this season due to a lack of support—financial and otherwise—from its board and, at present, is bottom of the Pro League table. After weeks of speculation regarding whether the “Electricity Boys” could do the Pro League justice at regional level, T&TEC wrote the Pro League and indicated its withdrawal from the regional competition. T&TEC’s move paved the way for reigning Caribbean champion, Caledonia, to mount a defence of its title. 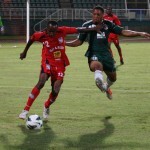 However, Caledonia AIA, according to the TT Pro League website, must now put out a US$1,000 registration fee by March 8 and raise funding to cover expenses that range from air and ground travel, hotel accommodation and meals for home and away games in the tournament that runs between April and May. But Caledonia coach Jerry Moe is happy for the challenge. “It’s our ambition to always represent at the Champions’ League,” Moe told the TT Pro League. The “Eastern Stallions” have already started adjusting to the opportunity. 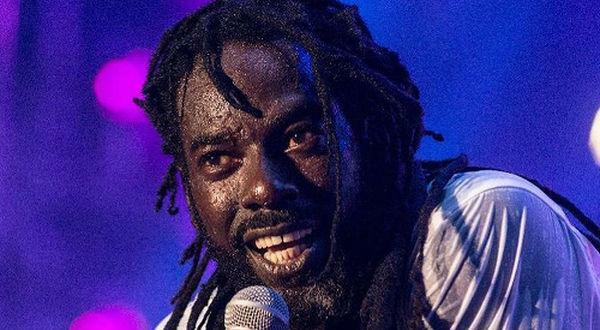 Last week, Caledonia welcomed central defender Nuru Muhammad and playmaker Densill Theobald back into the fold while striker Jamal Gay and Ataullah Guerra might be next. Theobald and Muhammed both featured on Friday night when Caledonia successfully defended its TTFF FA Trophy with a 2-0 win over Central FC. The 24-year-old Muhammad, who was due to play in the Finland Third Division, has decided to put himself back in the shop window by participating at CFU and, hopefully, CONCACAF level for Caledonia. Theobald and Gay, who was troubled by an injury, did not agree overseas deals while Guerra will return home on bereavement leave but it is not certain that he will return to Finland. Guerra’s elder brother, Marvin Guerra, was murdered on 17 February 2013 on St Paul’s Street. 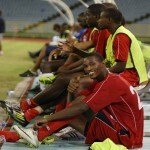 Photo: Caledonia AIA and Trinidad and Tobago midfielder Ataullah Guerra (foreground). Guyana international left wing back Walter Moore and former Trinidad and Tobago national under-20 captain and central defender Radanfah Abu Bakr have already signed with Kazakhstan Premier League club, FC Vostok. 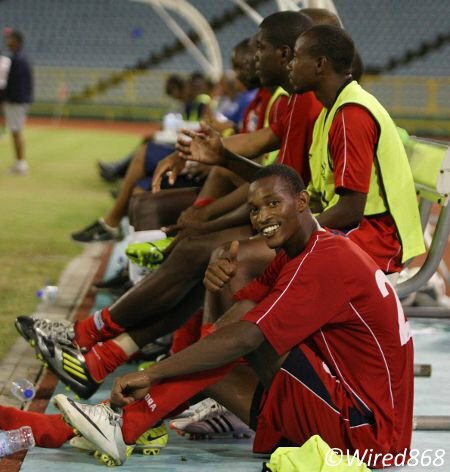 Guyanese teenaged wing sensation Trayon Bobb has already agreed terms with a Finland Third Division team while St Vincent and the Grenadines attacker Cornelius Stewart is also on the verge of a European move. Caledonia coach Jerry Moe might be spoilt for riches, once Caledonia can afford the additional salaries, as the likes of Trevin Caesar, Sheldon Holder, Miguel Romeo and Akim Armstrong have established themselves in the first team over the past two months. Unfortunately for T&TEC, it was business as usual in the Pro League this evening as the Electricity Boys fell 3-0 to sixth place Police FC at the Marvin Lee Stadium in Macoya. 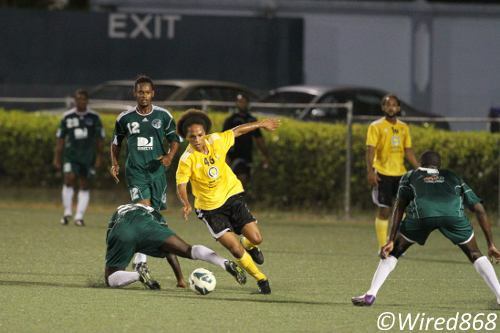 The “Lawmen” opened the score summary in the 17th minute with a cracking 22-yard strike from Anton Hutchinson and, despite losing right back Clevon McFee to a straight red card for a late hack on Nathaniel Garcia, Police scored twice more in the second half. 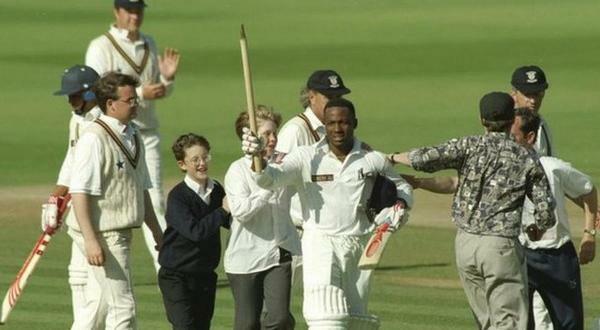 Photo: Police attacker Noel Williams (second from left) is congratulated by his teammates after a fine individual performance. Winger Noel Williams, who set up Hutchinson’s opener, doubled Police’s advantage with a clever lobbed finish in the 61st minute and then rounded off a productive evening by squaring for Kareem Perry who tapped home the third goal, two minutes from time. 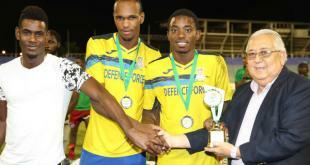 Defence Force matched the Police scoreline with a 3-0 triumph over St Ann’s Rangers. 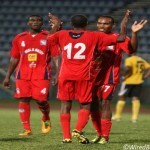 Leading Pro League scorer Devorn Jorsling scored twice in the first half and winger Kevon Carter grabbed another, midway through the second half, as the army/coast guard combination stretched its lead over second place Caledonia to seven points. Defence Force has played one game more than Caledonia though. And the Stallions are clearly readying themselves for a sustained assault on the frontrunners.